Australia and Russia have been engaging in a war of words over the downing of Malaysian Airlines flight MH17. The rhetoric is of course a minor part of the larger ongoing propaganda war over the way in which the crisis in Ukraine is perceived globally. Still, in addition to sanctions, Russia and Australia have continued to trade some particularly pointed remarks in recent weeks. In the immediate wake of the MH17 disaster, Australia was one of the leading voices in the international community seeking justice for the victims. Australia had 28 nationals onboard MH17, the highest number of any country after Malaysia and the Netherlands. Using its temporary seat on the UN Security Council, Australia drafted and submitted a resolution that allowed monitors on to the site and facilitated the return of bodies. Led by Foreign Minister Julie Bishop, who travelled to New York, Australia’s diplomatic efforts saw the bill unanimously adopted. Australia joined other Western nations in placing individual and economic sanctions on Russia in March after the annexation of Crimea. Last week, when Russia struck back applying sanctions to agricultural products, Australia was also affected. Australia exports more than $400 million in agricultural products to Russia every year, mostly beef, butter and seafood products. Overall two-way trade between the nations was valued at $1.79 billion in 2013. Australian farmers affected will not receive financial assistance from the government. Australia has two remaining cards it can play against the Russia government. In response to the agricultural sanctions the Australian government is threatening to block uranium exports to Russia. There is also discussion about banning Putin from attending the G-20 summit to be held in Brisbane later this year. However, it isn’t clear how either move would benefit Australia. Russia is far more concerned about the potential for additional economic sanctions from the European Union. Australia’s threats from the periphery are unlikely have any weight in Moscow. Russia’s Foreign Ministry unleashed a tirade against Australia and Bishop in the Russian media this week, saying Australia’s attacks were “unacceptable” and that Canberra had lost perspective on the situation in Ukraine. “Australian Foreign Minister Julie Bishop has gone farther than others in making irresponsible innuendoes against our country,” the ministry was quoted in the Russian media as saying. 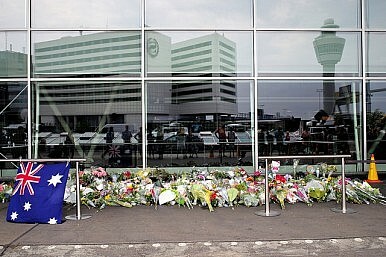 This week Abbott visited the Netherlands to offer condolences and thank the Dutch for their assistance in the investigation and in repatriating bodies. However, the prime minister’s visit has drawn criticism from Clive Palmer, who holds the balance of power in the senate. Palmer said Abbott was “deserting” the country during a budget crisis. The federal budget is in crisis as many of the government’s key policy measures have failed to pass the Upper House, which is controlled by a mix of independent and minor party senators. The Australian public has broadly approved of Tony Abbott’s handling of the MH17 disaster, with opinion polls showing a 12 per cent jump for Abbott as preferred prime minister over the opposition leader, Bill Shorten in the wake of the crisis. The result is smaller but similar in trend to the jump in personal support that then Prime Minister John Howard received following the September 11 attacks and the Bali Bombings terror attack. However not yet one year since the election that brought him to power, Abbott leads a deeply unpopular government following a budget of austerity widely seen as unfairly targeting poorer families.